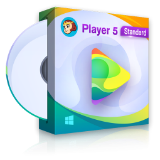 DVDFab Player 5.0.1 Standard was available as a giveaway on August 31, 2018! The reinvented DVDFab Player 5 features all-new playback engine that significantly improves stability, compatibility and playback smoothness; completely redesigned user interface that brings in totally different PC and TV playback modes both with distinctive media entertainment experience and ultimate playback capacity that supports navigation menus on DVDs, Blu-rays, and next-generation 4K Ultra HD Blu-rays, with genuine HDR10 and Hi-Res audio output, including Dolby Atmos, Dolby TrueHD, DTS-HD Master and DTS:X, etc. Please note: the program includes 2 year license with free updates! The best suggestion will be rewarded with the full-functioning lifetime license for DVDFab Player 5 Pro Version! Please use the IdeaInformer widget for your ideas! How would you improve DVDFab Player 5.0.1 Standard? Be able to change the background colour. Forking this to Linux would make this a must have software for everyone. Getting msg of " Wrong name or password" ...not activating...pls guide to activate the same. OK There seems to be a lot of problems so first the email that comes back probably goes strait to junk mail. Second don't use your email to register in the mail it shows you the email address to register. That said this is a most generous offer with two year registration. and a fine DVD / blue-ray player. there are so many free ones that I find the 60.00 price tag on this ridiculous but in standing with with most offerings of DVDfab their way overboard on the pricing of all their offerings. I think they need to rethink there whole business model lowering there prices would make them whole lot more money. For 99.9% of all that I would hope to play, VLC does the job perfectly well and with and in a market where there is a good range of free players, I can't really see where most paid ones really have anything to offer that is really worth paying for. This could be one of those cases with email from certain domains being rejected ? (Yahoo was the goat, last time.) I left my email addr. at the designated place -- twice -- and hours later: Nada, Zip, No Response. Changed to a different browser and left an alternate-domain email, and received the info right away. It applied and activated via the standard Cut & Paste, No Problemo. I'm guessing that everyone is getting the same reply info, which surely won't remain a secret for long. Some have asked "but what do I do for BR ? ", if the computer did not come with such an optical drive. In that case, if you wanted the easier way out, I can heartily recommend the LG Super Multi Blue external. It supports both e-SATA and USB connection, but you'd probably want to go e-SATA. (I'm a private user, not affiliated with any company, and will always give the Good, the Bad, or the Ugly about any product, straight up.) Since I got mine quite some time ago, I don't even know whether this model is still on the market. I'm hoping today's giveaway will prove to be a good alternative to the Cyberlink PowerDVD Player software that came bundled with the drive, since that player is (deliberately) limited and kind of annoying in several respects. This could be one of those cases with email from certain domains being rejected ? (Yahoo was the goat, last time.) I left my email addr. at the designated place -- twice -- and hours later: Nada, Zip, No Response. Changed to a different browser and left an alternate-domain email, and received the info right away. It applied and activated via the standard Cut & Paste, No Problemo. I'm guessing that everyone is getting the same reply info, which surely won't remain a secret for long. Some have asked "but what do I do for BR ? ", if the computer did not come with such an optical drive. In that case, if you wanted the easier way out, I can heartily recommend the LG Super Multi Blue external. It supports both e-SATA and USB connection, but you'd probably want to go e-SATA. (I'm a private user, not affiliated with any company, and will always give the Good, the Bad, or the Ugly about any product, straight up.) Since I got mine quite some time ago, I don't even know whether this model is still on the market. I'm hoping today's giveaway will prove to be a good alternative to the Cyberlink PowerDVD Player software that came bundled with the drive, since that player is (deliberately) limited and kind of annoying in several respects. Been over an hour waiting for activation email. Is this just a ploy to get my email address to spam me to death? Scott, Did you put your email in the 1st. page of https://www.dvdfab.cn/co-giveaway.htm where it denotes "0" price giveaway?Assuming you did, make sure that you didn't leave an open space at the end of ".com_". That sometimes misidentifies the return email address. Hope this helps. Why do you make everything so complicated? I've been trying to activate my copy of your software for several hours without success. Can you help me? triviaace, I thought I had the key but the program would not work. I tried to play a blu-ray disc but all I got was the disc menu (ie play, scene selection, extras, etc.) but the disc will not play, in fact when I try to actuate play, nothing happens. The ID and PW seem to be all right since it says that the program is licensed to me. What is wrong here? I received the email, but can't find where to enter the information. The program seems to be working properly. Is this similar to their other software offers where you have to download all the added trialware? Mark - No, this is a separate program, that you run directly, not through the main DVDFab program, or download from the program. again i have not received the password. DVDFAB ,mostly Just Ok player and products to me, have been testing DVDFAB player & downloader products versions since last year, but even their latest player version is still lacking hot features that Free media players have, to justify their high price. **Have emailed their support as potential buying 1st time client several times, no one has ever bothered to reply, so they alos have poor, NON-Existent support. **Still no Audio normalizer option, for low and high volume songs, so if convert all videos or songs from , all volume are not all over the place. ****Still even DVDFAB latest Player version cannot even open and save in most common M3U/M3U8 playlists format, even though most free media players can do this hot basic option. DVDFAB ,mostly Just Ok player and products to me, have been testing DVDFAB player & downloader products versions since last year, but even their latest player version is still lacking hot features that Free media players have, to justify their high price. **Have emailed their support as potential buying 1st time client several times, no one has ever bothered to reply, so they alos have poor, NON-Existent support. Unless missed still could not find any of these hot options in this player: *Still no (Superhot common feature) like a (Video and audio Crossfader) to watch & mix, or fade out end live or music and Karaoke videos together, that a lot of people are doing these days **Still no Audio normalizer option, for low and high volume songs, so if convert all videos or songs from , all volume are not all over the place. ***Player still needs more useful video and audio enhancements features ****Still even DVDFAB latest Player version cannot even open and save in most common M3U/M3U8 playlists format, even though most free media players can do this hot basic option. I had to do the type in code to get it to work and I am very happy with it. I already have the DVD Copy software and have enjoyed it for years. It is the best quality copy software I have ever used. If I had a Bluray player I would get that copy package as well. Great software from a great company. Their help desk if full of great people that do just that. They help you. I had to do the type in code to get it to work and I am very happy with it. I already have the DVD Copy software and have enjoyed it for years. It is the best quality copy software I have ever used. If I had a Bluray player I would get that copy package as well. Great software from a great company. Their help desk if full of great people that do just that. They help you. NO Email, does someone have the Key, usually no problem with gotd? Thanks everyone and Good Luck ! NO Email, does someone have the Key, usually no problem with gotd? Thanks everyone and Good Luck ! I downloaded the player, installed it have full control over playback options, such as subtitles, audio, video ratio aspects. Everything seems to be in working order. So not sure if the devs had corrected something in the installer, or GAOD did something but I am right now watching the second half of Stephen Kings Rose Red. Sound is good, picture clarity is good. I'm not sure where I' am supposed to put in email and a password, or is there a key code I need to fully activate it??? I downloaded the player, installed it have full control over playback options, such as subtitles, audio, video ratio aspects. Everything seems to be in working order. So not sure if the devs had corrected something in the installer, or GAOD did something but I am right now watching the second half of Stephen Kings Rose Red. Sound is good, picture clarity is good. I'm not sure where I' am supposed to put in email and a password, or is there a key code I need to fully activate it??? Does DVDFab Player Version 5.0.1 play ISO files? Version 2 did, but Version 3 did not. Stephe, That's the main reason I still use v.2. Well I never have problems with installations but today I am not receiving the email. Yes I entered it correctly and checked spam folders. has now been 20 minutes and no email. I already own one software title from DVDFab so I tried my existing password which it looked like it took but program still says expires today. Well I never have problems with installations but today I am not receiving the email. Yes I entered it correctly and checked spam folders. has now been 20 minutes and no email. I already own one software title from DVDFab so I tried my existing password which it looked like it took but program still says expires today. Sorry that was 30 days until expiration. The registration process is a little more complicated than usual, but manageable. I tried 4 commercial Blu-ray discs, the sound starts playing, no video, than after 10 seconds the sound starts skipping. I tried skipping forward and back, no video on any setting (different aspect ratios), just skipping sound. Thumbs down. OK, I found the problem, I had to disable hardware acceleration and now it works fine. If I already have DVDFab installed because I have other licenses, can I just enter the GOTD license code to enable this feature? Trevor, DVDPlayer is a seperate program from DVDFab. So you can have 1 license for other DVD Fab products, and a completely seperate license for this program. Also had the invalid email address / password. We had the same problem with another DVDFab giveaway last week. It took them nearly a day to clear it up, but it was also a week long giveaway. Robert was right, you can copy & paste the email address, but the password has to be manually typed. Book Guy, you can also copy and paste the password, but be carefully of the space at the end of password. If you still have an optical drive surely you would have the software to use it by now? My optical drives are in the bin along with the VHS and Philips cassette. If you still have an optical drive surely you would have the software to use it by now? My optical drives are in the bin along with the VHS and Philips cassette. We also want to play what our local library has on the shelves free.
. [ peter ], We also want to play what our local library has on the shelves free. .
Manually typing in the password instead of copy and paste gets activation done. ok so I followed all the directions as per email and it will not activae at all keeps saying "wrong email/password. I got the same thing. Then I pasted the password I had just copied into Notepad and there was a space at the end. I removed that and copy/pasted it again and it worked. Greg, I got the same thing. Then I pasted the password I had just copied into Notepad and there was a space at the end. I removed that and copy/pasted it again and it worked. No issues with install and registration. My current Blu-Ray player is ancient so a name for comparison would not be fair. This beats it in almost all regards. I "tested" with a movie that I have both DVD and Blu-Ray. I watched Blu-Ray first which meant that the DVD copy was excruciating to watch. Especially with captions enabled. The Blu-Ray picture was excellent. The sound was much better than the sound from my other players that do Blu-Ray. Moving the cursor to the bottom of the screen pops up the controls. More extensive controls and the setting menu are accessed by a right click. One odd (to me) glitch that I found and tested three times on the Blu-Ray is that the player froze if I clicked and advanced position on the timeline a SECOND time. The first time, instant jump. The second was a freeze. No issues with install and registration. My current Blu-Ray player is ancient so a name for comparison would not be fair. This beats it in almost all regards. I "tested" with a movie that I have both DVD and Blu-Ray. I watched Blu-Ray first which meant that the DVD copy was excruciating to watch. Especially with captions enabled. The Blu-Ray picture was excellent. The sound was much better than the sound from my other players that do Blu-Ray. Moving the cursor to the bottom of the screen pops up the controls. More extensive controls and the setting menu are accessed by a right click. One odd (to me) glitch that I found and tested three times on the Blu-Ray is that the player froze if I clicked and advanced position on the timeline a SECOND time. The first time, instant jump. The second was a freeze. I have not received the password after installation. I have not received the password after installation. I have verified spam. Activation worked fine for me - once I realised it is 'not' your own email address you use. Email and reg code provided in email does not activate software. D/L and installed fine. Email and reg code provided in email does not activate software. Waste of time. Uninstalled. Email and password not accepted.Why? Robert Q., please make you entered right account and password, without extra space. Only DWD-RW on my Pc. How play Blu-Ray discs on it? Only DWD-RW on my Pc. How play Blu-Ray discs on it? Gloria, You have to install a Blu-Ray drive in your computer to play Blu-Ray disks. Insert a DVD, run today's GOTD giveaway of the DVDFab Blu-ray player, and use it to watch the content of the DVD through to the end ( you must play the disc complete from beginning to end ), then when you eject the DVD, you will see that it has been converted to Blu-ray.
. [ Gloria ], Insert a DVD, run today's GOTD giveaway of the DVDFab Blu-ray player, and use it to watch the content of the DVD through to the end ( you must play the disc complete from beginning to end ), then when you eject the DVD, you will see that it has been converted to Blu-ray. .
Greg, what should Gloria do if she only has a Blu Ray player on her PC if she wants to burn a CD? Now there is a multi-player burner on all PCs. Are PCs sold with a multi-player burner that can process Blu-ray? I will not even consider buying something like that. Greg, what should Gloria do if she only has a Blu Ray player on her PC if she wants to burn a CD? Now there is a multi-player burner on all PCs. Are PCs sold with a multi-player burner that can process Blu-ray? I will not even consider buying something like that. Jan Van Looveren, I checked in PC World and not one of their laptops has an optical drive. Its obsolete! peter, you forgot the fact that an optical drive adds weight to laptops. Laptop manufacturers want to keep weight as low as possible. My Macbook Pro does not have one - I bought and external DVD drive for it. Many cars today come without a spare tire - less weight, better gas mileage. peter, you forgot the fact that an optical drive adds weight to laptops. Laptop manufacturers want to keep weight as low as possible. My Macbook Pro does not have one - I bought and external DVD drive for it. Many cars today come without a spare tire - less weight, better gas mileage. Peter Blaise: she does not have a Blu-Ray drive on her computer. She cannot play Blu-Ray content. If there is some scientific advance which means the playing of an ordinary DVD on an ordinary DVD drive via a Blu-Ray software player automatically converts that ordinary DVD to Blu-Ray, that is news to me. But even if that actually happened, Gloria still would not be able to play a converted-to-Blu-Ray DVD without a Blu-Ray drive. So the conversion is pointless. Can you explain your comment a bit further because I won't be the only one who doesn't understand it? peter, you obviously looked at all the ultra thin laptops not the standard size laptops to larger 17" laptops which do have optical drives. Also PCWorld is not the extent of the current marketplace choices! That's 3 OEM makes still incorporating optical drives in current models... look at the pictures where optical drives are not mentioned in the specs. Sometimes they are overlooked in specs but are still there in the device. There are good reasons to buying a full sized laptop with an optical drive one is that the optical drives bay can be repurpposed to add an extra hard drive upto around 2TB extra storage space and the optical drive fitted into an external USB bridge enclosure to keep optical functionality when needed. your idea that optical drives and media are obsolete is just as incorrect today as it was the other day when you tried to preach it then too. peter, you obviously looked at all the ultra thin laptops not the standard size laptops to larger 17" laptops which do have optical drives. Also PCWorld is not the extent of the current marketplace choices! https://smile.amazon.co.uk/Inspiron-17-Laptop-i5-8250U-Silver/dp/B07BMF31H6/ref=sr_1_5?ie=UTF8&qid=1535756515&sr=8-5&keywords=17%22+laptop https://smile.amazon.co.uk/dp/B079KQ5SQG/ref=psdc_429886031_t2_B07BMF31H6 https://smile.amazon.co.uk/dp/B0733B1Y9Z/ref=psdc_429886031_t3_B07BMF31H6 That's 3 OEM makes still incorporating optical drives in current models... look at the pictures where optical drives are not mentioned in the specs. Sometimes they are overlooked in specs but are still there in the device. There are good reasons to buying a full sized laptop with an optical drive one is that the optical drives bay can be repurpposed to add an extra hard drive upto around 2TB extra storage space and the optical drive fitted into an external USB bridge enclosure to keep optical functionality when needed. your idea that optical drives and media are obsolete is just as incorrect today as it was the other day when you tried to preach it then too. Most folks don't realize that they can turn the disk upside down and play the other side, so the light reflects better during playback -- but hold all of 'em in your hand at an angle to a bright light and what reflection do you see? They've been selling us blue disks all along without labeling them, and now they are charging extra just for the label. All discs are blue, and they all play in all players. This software just labels the one's that aren't labeled blue yet as blue now. Give it a try, you'll see.
. [ PeterW ], Most folks don't realize that they can turn the disk upside down and play the other side, so the light reflects better during playback -- but hold all of 'em in your hand at an angle to a bright light and what reflection do you see? Blue, am I right? They've been selling us blue disks all along without labeling them, and now they are charging extra just for the label. It's all marketing hooey. All discs are blue, and they all play in all players. This software just labels the one's that aren't labeled blue yet as blue now. Give it a try, you'll see. Good software. .
Gloria, this giveaway is the STANDARD version of the software. The "ULTRA" version is needed to Blu-ray MENU Support, which is not given away!!! Gloria, this giveaway is the STANDARD version of the software. The "ULTRA" version is needed to Blu-ray MENU Support, which is not given away!!! The destination file could not be created. Windows cannot complete the extraction. The destination file could not be created. Over an hour and still not received registration. Download, install ok. entering a password. paul, Please make sure you entered the right account, without space at the end. @crumhorner Thanks for your question. This is DVDFab support. The license we giveaway is 2 -licence with free update. After 2 years, you still can use it but without free update. @crumhorner Thanks for your question. This is DVDFab support. The license we giveaway is 2 -licence with free update. After 2 years, you still can use it but without free update. Lucy, Thank you. I hope that other developers will include this information with their giveaways - and that you continue to do so. It's very helpful. Developer, thank you for the generous 2 year licence. With updates. Please could you spell out what will happen in 2 years time? Will the program stop working altogether, or will it simply reject updates? Many GOTD users have asked this kind of question for years and it surprises me that GOTD don't routinely ask for this information to be included. I hope you can find time to respond. Developer, thank you for the generous 2 year licence. With updates. Please could you spell out what will happen in 2 years time? Will the program stop working altogether, or will it simply reject updates? Many GOTD users have asked this kind of question for years and it surprises me that GOTD don't routinely ask for this information to be included. I hope you can find time to respond. crumhorner, Apart from the censors ("moderators") GAOTD ignore comments and requests. This will doubtless be removed. Laxative, you may be right. But the fact that my question got several upvotes within one minute of posting does suggest that it's an important question. I can't understand why the issue hasn't been addressed over the years! crumhorner, The reason is as I said. The first upvote was mine. I gave facts, explanation, but not justification. I believe the reason this is rarely, if ever, addressed is because they expect you to have made a decision by then about whether you want to BUY the program or not. This site has a purpose, and that is to have You tell all your friends about how good a program is so they can buy it. And, hopefully, you will buy it too because you like it so much. But, having been signed up to GOTD for many years, I can tell you that it is very rare that a program will just stop working. Mostly, it continues to work, but is destined to become obsolete without updates. crumhorner, I believe the reason this is rarely, if ever, addressed is because they expect you to have made a decision by then about whether you want to BUY the program or not. This site has a purpose, and that is to have You tell all your friends about how good a program is so they can buy it. And, hopefully, you will buy it too because you like it so much. But, having been signed up to GOTD for many years, I can tell you that it is very rare that a program will just stop working. Mostly, it continues to work, but is destined to become obsolete without updates. Robert and Yanco, I fully understand. It's polite to tell the user what's likely to happen after the trial period, though. Credit to today's developers for doing so. Thanks Lucy & DVDFab. •you have to install AND activate/register the product according to instructions given in the readme.txt file attached to every GOTD package. •it should be done while the giveaway offer for the software is still on (within 24 hours). Still we do not provide you with the lifetime license in terms of the fact that our package can be used to install the program on giveaway date only. It means that you will not be able to re-install the program after PC crash or install the program on another PC after the giveaway day is over." That implies non-expiring license NOT a trial of ANY type, 14 days, 28 days, 60 days, 6 months, 12 months of 24 months duration... Just no re-installation after the giveaway day in the event of a computers windows re-installation or new computer purchase. Robert, In the blurb about the project from the FAQ page: "Is GOTD a trial? Every program we give away is not a trial. We provide you with full-functioning registered version of software titles. There are two points you need to remember: •you have to install AND activate/register the product according to instructions given in the readme.txt file attached to every GOTD package. •it should be done while the giveaway offer for the software is still on (within 24 hours). Still we do not provide you with the lifetime license in terms of the fact that our package can be used to install the program on giveaway date only. It means that you will not be able to re-install the program after PC crash or install the program on another PC after the giveaway day is over." That implies non-expiring license NOT a trial of ANY type, 14 days, 28 days, 60 days, 6 months, 12 months of 24 months duration... Just no re-installation after the giveaway day in the event of a computers windows re-installation or new computer purchase.